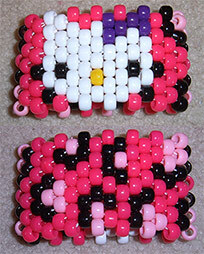 This tutorial will teach you how to make a Hello Kitty cuff kandi bracelet, and in the process you will also learn how to follow patterns, and how to make multi-stitch kandi cuffs in general. If you really want to learn how to follow kandi patterns, you will need to keep referring back to the pattern to understand why we start at the bead we do. 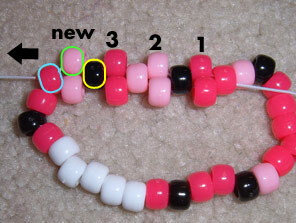 Supplies you'll need: scissors, elastic string, 6x9mm pony beads in the colors shown below. This tutorial is copyright to Kirsty Forrester of kandipatterns.com and cannot be redistributed. Click the image to the left to download a printable PDF of the pattern, bead rows, and bead counts. I strongly recommend you print this out and follow along if you want to fully understand how to read patterns. Hopefully you can see how the pattern goes from there. Note that you shouldn't rely entirely on this chart, because it may not work for every single pattern, and it definitely doesn't work if you make the cuff in a different way, e.g. tie off after every row. You should keep checking your cuff with the pattern to make sure you're on track. Cut a long piece of string - as long as you are comfortable working with. You can always tie on more later. 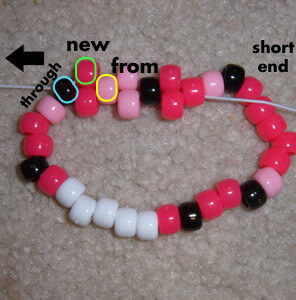 Then string 30 beads in the order shown above, and move the long end of the string to the right hand side. 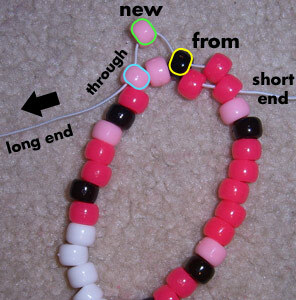 Then, take the long end of the string, and pull it through the first bead at the end of the short end - the hot pink one. 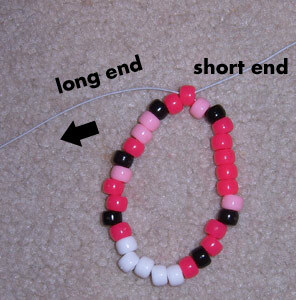 Pull the long end of the string tightly until the beads come together to form a single stranded bracelet. Your string should be coming out of a hot pink bead. So now we're on row 2. The first bead we'll string is a hot pink one. Why? 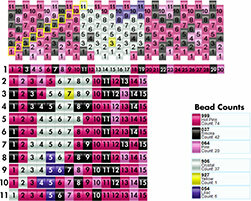 Refer back to the bead chart and pattern. On row 2, we start at the 1st bead, outlined in green. That bead is hot pink. In the picture on the left, and future pictures, the bead highlighted in yellow is where our string is coming from, the green one is the new bead, and the blue one is the bead we're pulling through. 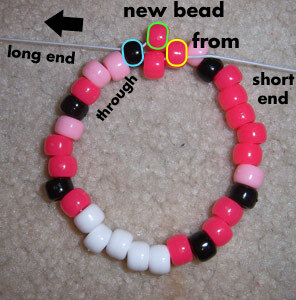 So, string your hot pink bead, skip a bead, and pull through the black bead. 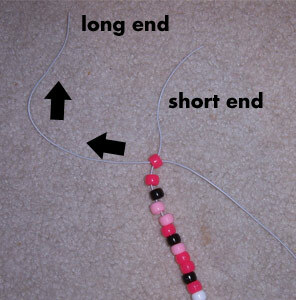 Then pull the long end of the string tight until the beads snap into place. Be careful not to pull too tight, especially if you are using plastic string rather than elasticated string. The next bead we string is light pink. We're coming from a black bead, and stringing through another light pink bead. 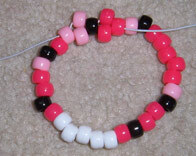 The bead that we skipped is light pink. The next bead we string is hot pink. We're coming from a light pink bead, stringing through a black bead. The bead we skipped is a hot pink one. The next bead we string is light pink. We're coming from a black bead, stringing through a hot pink bead. The bead we skipped is a light pink one. 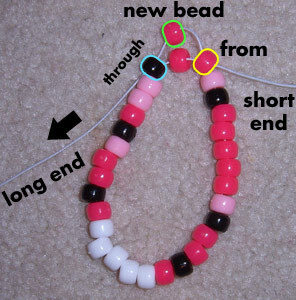 By this time I hope you get the idea of how to string beads. Continue the rest of the row yourself, using the chart below. Bead 5 is next. Remember to skip a bead. When you get to bead 15, I'll resume with the photos. Last bead of row 2! It's a light pink bead. 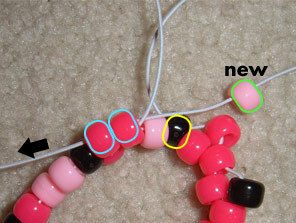 We're coming froma black bead and going through two hot pink ones to complete the row.